recreation venue for both professional and amateur cyclists. 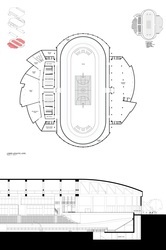 The facility would provide multiple services throughout all times of the day to cater to all types of users and accomplish a goal of making track cycling a more public sport. 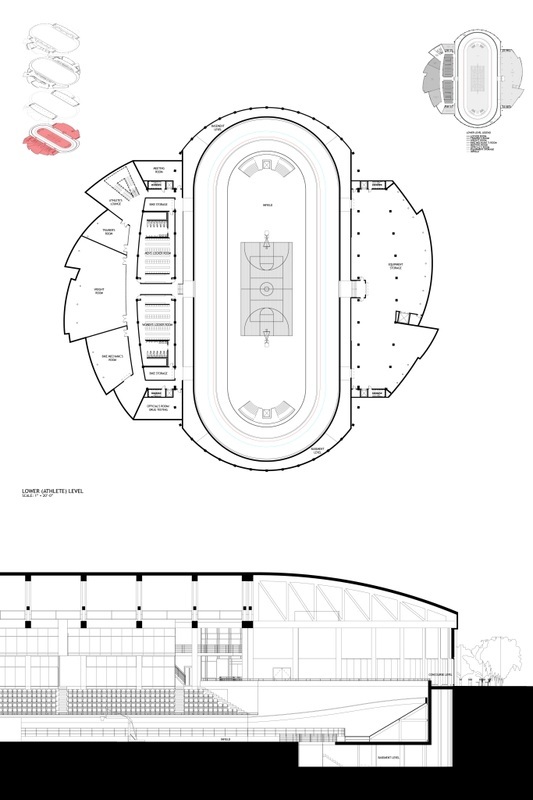 The facility would contain a fieldhouse (with seating for 2,000 spectators), a fitness center, a restaurant/bar, a banquet hall, meeting rooms, and administrative offices. The design concept of a vortex was used, both figuratively and literally, in attempt to solve all of the major programming issues. 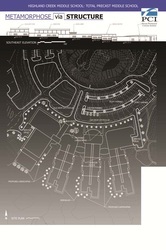 The idea of a vortex as drawing in the surrounding community was used to develop the shape of the plan. 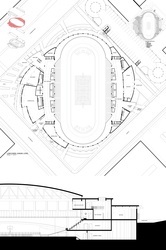 The elliptical motion that riders take on the track was pulled out to the exterior of the building to create a segmented curved façade that breaks up different programmatical areas. 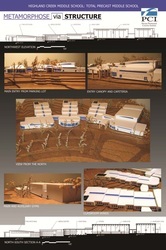 public spaces) to be placed at grade level and allow for maximum views into the building and down onto the track. 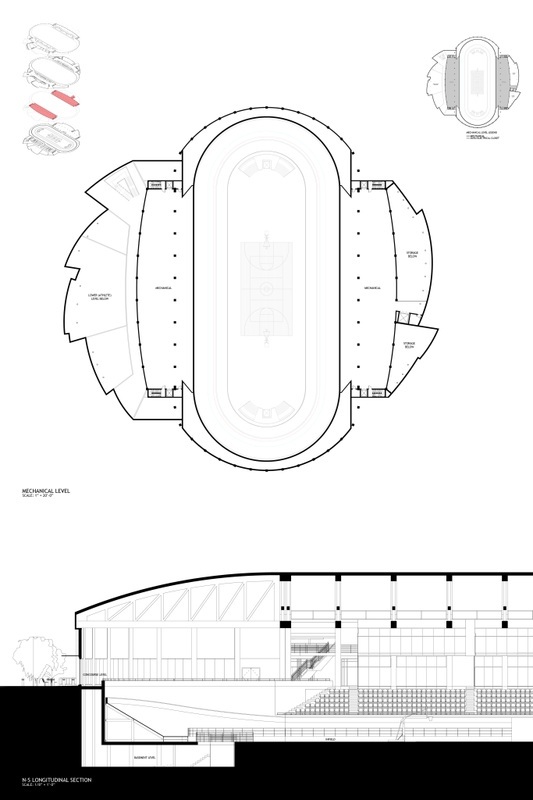 This helped fulfill one of the design goals of promoting interaction between the general public and track cycling as a sport. 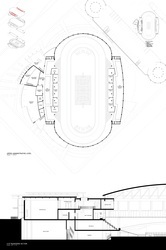 Administrative areas were placed on the second level overlooking the track. 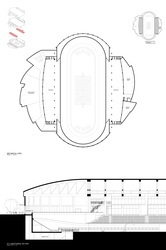 The massive roof is supported by curved wooden trusses to give the arena area and old-fashioned fieldhouse feel. The Water Sciences and Engineering Laboratory (WSEL) is a small 4 level building on the UW-Madison campus that sits directly on the shore of Lake Mendota. The project involved a renovation of the outdated building to better suit the needs of the Water Sciences department. 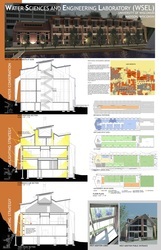 A specific program was developed during multiple meetings with heads of the department and university architects. The existing building is comprised of a pump house, which at one time supplied water to the entire campus, and 2 different additions (the Tank House and Hydraulics Lab). Different structural systems were used for each portion and not one floor level remained consistent at any segment transition. Although it is a small discipline, the Water Sciences department is a very proud, close-knit community that conducts very prestigious research. They wanted a facility that better allowed them to conduct their large-scale experiments without losing their identity as the hidden gem on campus. The goal of the project was to insert state-of-the-art laboratory space into the disjointed interior with a focus on sustainability. It was also determined that 5,000sf of new space was needed. 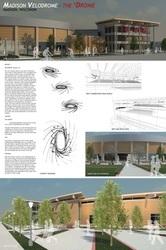 The design concept was to address all 3 goals with the combination of a new curtain wall and glulam structural system. 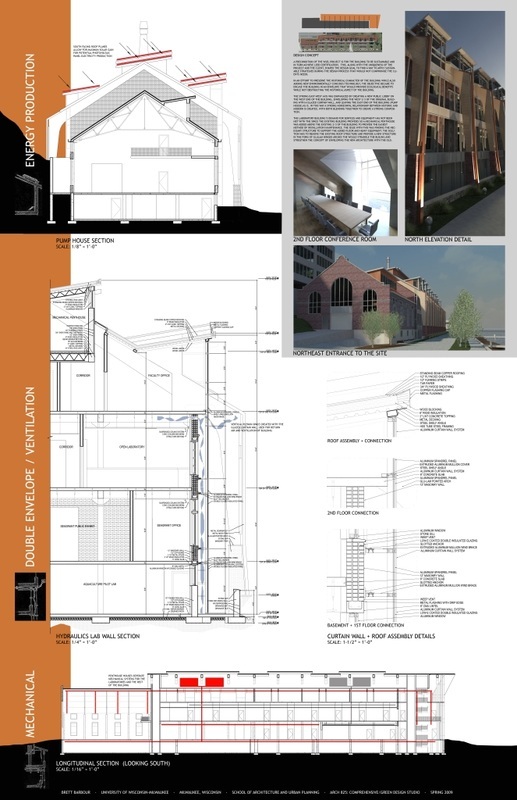 The curtain wall on the long sides of the building create a double envelope to improve energy efficiency and the glulam structural system spans the existing load-bearing masonry walls to open up the attic level for greater use and create a new mechanical penthouse level to centralize the HVAC equipment. Together, they preserve the historical integrity of the brick while giving the exterior façade a distinguished look by adding another layer to the composition. The curtain wall extends past the west end of the building to enclose a new space the serves as the main entry the original building lacked. The interior of the building was gutted to create a consistent double loaded corridor through all floors. 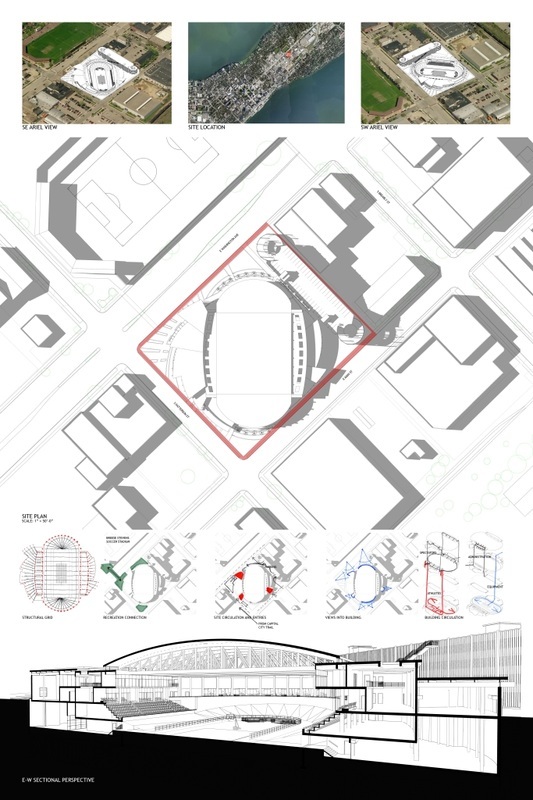 The Art Complex was also a collaboration between the UW-Milwaukee School of Architecture and UW-Madison. 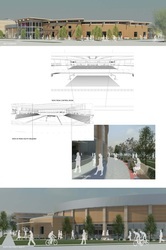 The project involved the design of an art building and parking garage on an existing parking lot. Currently, different parts of the art program are spread all over campus and the Art Department wanted to consolidate all of them into a new single building. 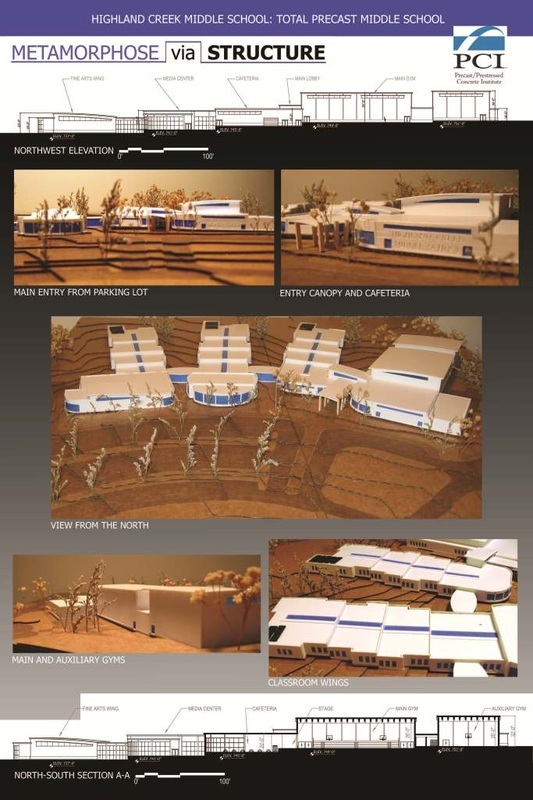 A very unique and important aspect to the project was the restriction of not being able to build within 20ft of a KVA line that runs on a curve, 15ft underground, through the middle of the site. 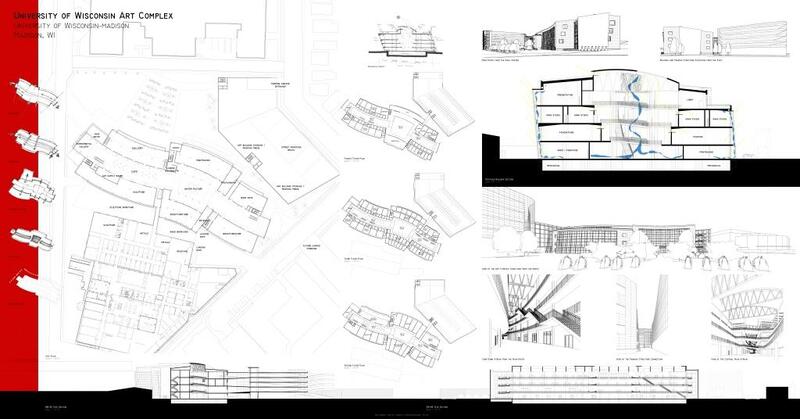 Creating useable space for so many different disciplines in one cohesive building was also a key design focus. 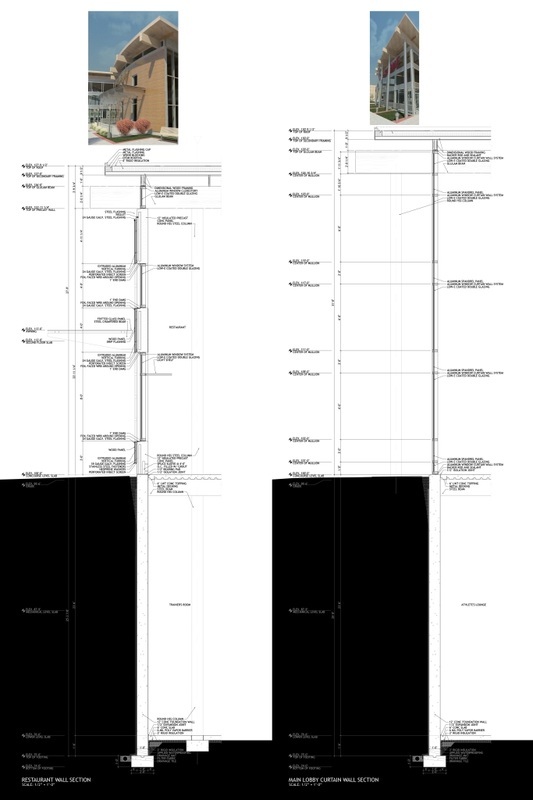 The design concept was to create a central atrium corridor that spanned the length of the building. This alloweddifferent floor levels to serve different functions while maintaining a sense connection between all building users. 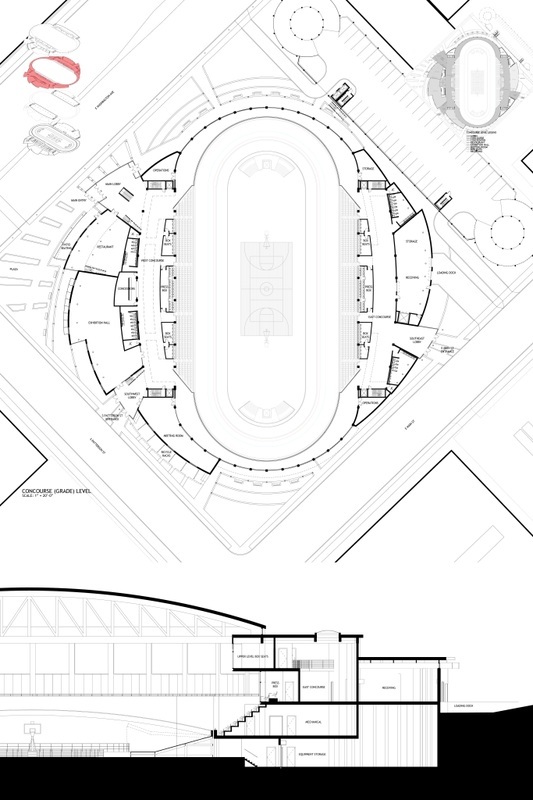 The atrium creates a central social heart for users to interact when not in individual offices and studios. The atrium also addresses sustainability issues. The open space encourages vertical air movement when interacting with a double skin envelope on the exterior to promote quality air circulation. It also allows almost every room in the building to receive natural lighting with the use of light shelves. 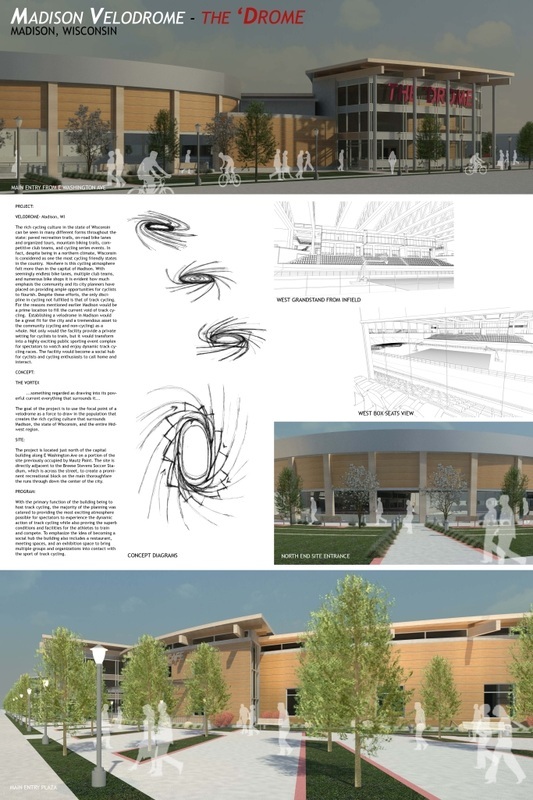 The curved plan and sloping exterior walls produce an artistic form that compliments its use as an art building. 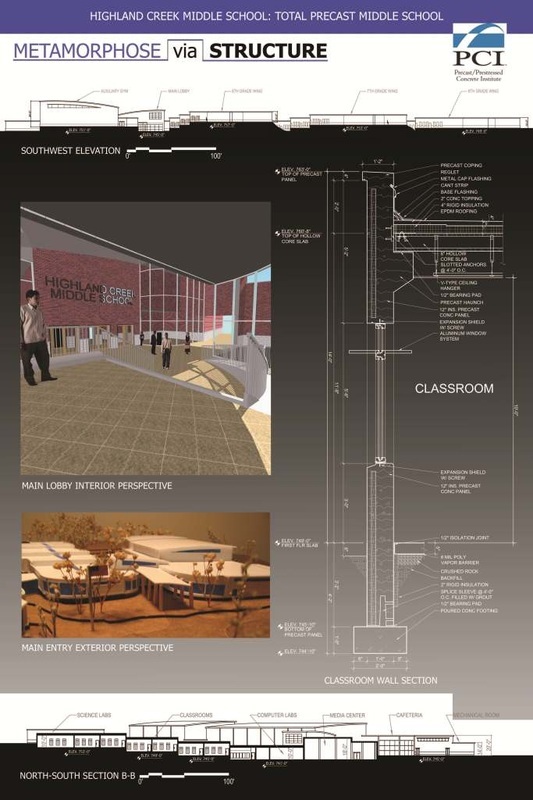 As an entry in the 2008 Precast Concrete Institute (PCI) Architectural Design Competition this design placed 2nd in the site-specific category. 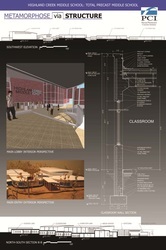 The project involved the design of a 1,200 student middle school. 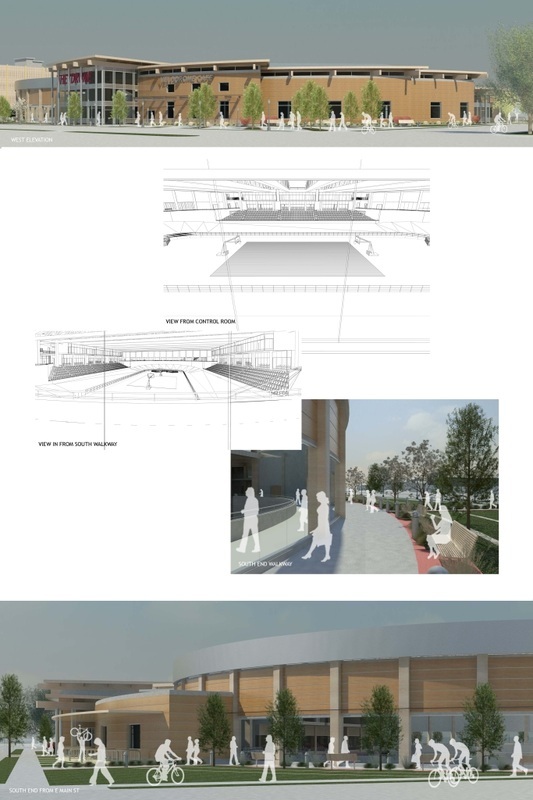 The purpose of the competition was to promote the use of precast concrete as a sensible choice of a primary building material in the construction of educational facilities. Thus, the competition required the building to be constructed entirely of structural precast concrete. The location of the project was provided, a large sloping site adjacent to an existing elementary school surrounded by a nature preserve. 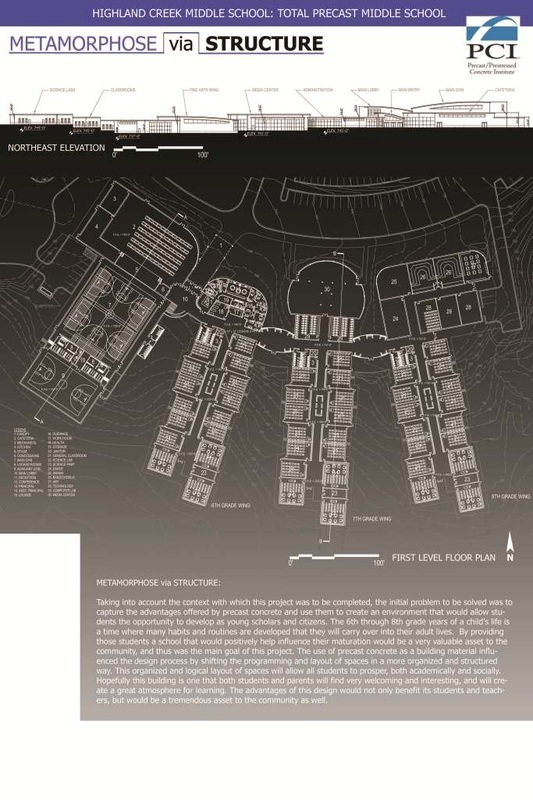 The design centered on the idea to separate out the programmatic functions of the building into individual wings for each grade level (6, 7, and 8th grade). Classrooms are lined down wide single corridors to ensure that each room is allowed natural light. The corridors employ gradual ramps down the hallways to accommodate a moderate grade change towards the rear of the site. 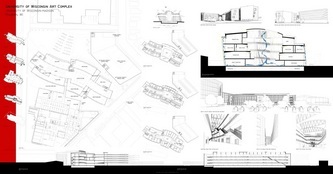 Major, more visible, programmatic element such as the media center, administration offices, and fine arts rooms were located at the heads of each of these wings forming the main elevation of the school. 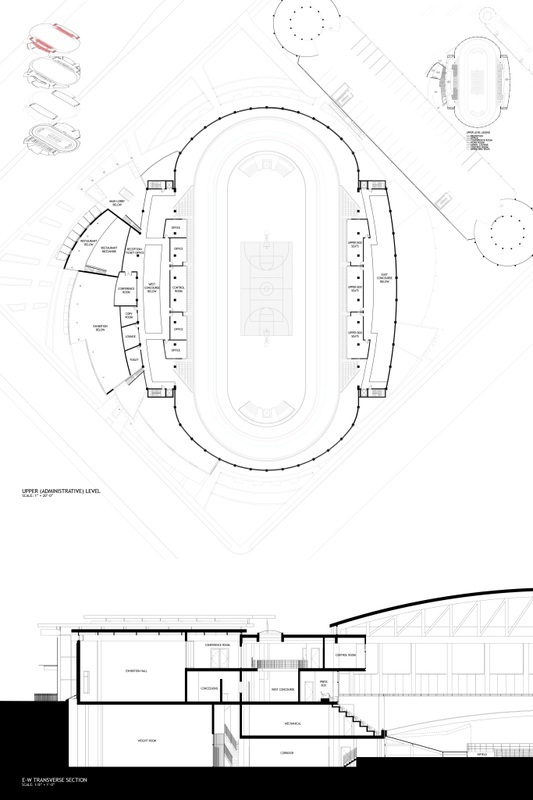 The large areas of the gymnasiums and cafeteria were grouped to create a fourth wing separate from the academic areas. The spaces that connect these wings serve as social hubs to encourage interaction among students and teachers, one of them being the main lobby of the school. 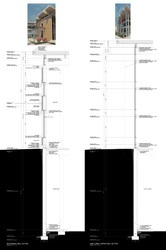 To satisfy the precast requirements the classroom walls were designed as 6’6" wide structural panels that repeat throughout the length of each classroom wing. The roofs of each of these wings are constructed of hollow core precast panels. The exterior walls of the remainder of the school are also structural precast panels with the roof elements spanning large distances made of curved precast double-tees. 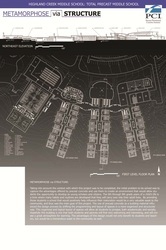 This studio began as a collective class project to design a master plan for the heavily Hurricane Katrina damaged Lower Ninth Ward in New Orleans. Then, using the master plan as a guide, students broke off into individual self-selected projects. I chose to focus on delving more deeply into the geen space master plan I had developed as part of the overall master plan. The specific project involved the design of a park adjacent to the industrial canal locks, including a path to connect the park to the rest of the planned park system. The goal for the park was to emphasize the goal of the overall master plan - to encourage residents to return home by improving the necessary infrastructure to make living there comfortable again. A park and path that focused on the existing natural feature of the industrial canal, located at the "front door" to the Lower Ninth Ward, was thought of as a way to stimulate green space development and start a network of linkages between green spaces. 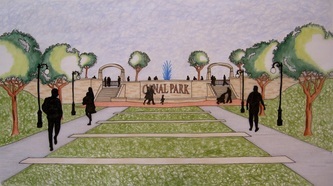 The park path follows 2 existing rows of 8 massive live oak trees that survived the hurricane. A separated path that runs between the 2 rows connects a boardwalk to the North to a path to the South. The boardwalk is located on the canal side of the levee wall and extends to the North end of the Ward where it connects with a park along Florida Avenue. The path to the South runs along the top of the levee to the Mississippi River in the Holy Cross Neighborhood where it also connects to another proposed park. The park itself allows for many different activities with the placement of a gazebo, seating alcoves, an amphitheater and a children’s water feature. The final presentation included hand drawn site plan, site section, and perspective renderings.